There are doctors who quickly hear what you say and in no time start scribbling on the prescription pad. There are doctors who talk more than what you would like to hear and you wonder if they even heard what you said. And then, there are doctors who hear you out, understand your condition, offer the right advice and then take a step forward. They care and take an initiative to help out patients in general and not just their patients! I am lucky I found Dr. Shashank Akerkar! It took me more than a year to find the right doctor for treatment of Fibromyalgia but the wait was worth it. When I started consulting Rheumatologist Dr. Shashank Akerkar, I had already been misdiagnosed and was undergoing treatment for Seronegative Spondyloarthropathy. The symptoms of both the conditions are quite similar but Dr. Akerkar suggested an MRI and soon it was clear that I have Fibromyalgia. Thanks to his treatment, I am able to manage life a bit better and work part-time. 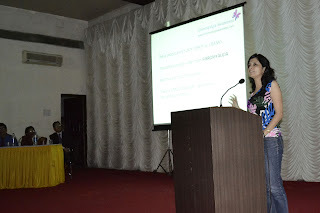 On Sunday, 7th October 2012, Dr. Akerkar organised a meet to mark World Arthritis Day. The purpose of the meet was to bring patients with arthritis / other chronic pain diseases and doctors under one roof. The meet included awareness and information videos about the conditions, presentations by leading doctors, patient support initiatives and much more. It was interesting to watch a video created by Dr. Akerkar on how to manage the smallest household chores if someone has chronic pain. It included things like holding a cooking pan the right way and the kind of mop one can use for ease in cleaning floors. To a common man, these tips would not make much sense, but for people wiith chronic pain, these small changes help a lot! Dr. Akerkar launched a Free Lupus App for the benefit of patients. He also announced the launch of an Arthritis Library that will have the best books on Arthritis and Chronic Pain. Dr. S. Akerkar, Consultant Rheumatologist, Mumbai Arthritis Clinic, spoke about how to conquer one's arthritis. He gave us the platform to speak about Fibromyalgia and create awareness about the debilitating condition. I, Anuradha Khanna Pentapalli (fibromyalgiaawareness.com) and Sagarika (of The Purple Pact fame), who suffer from Fibromyalgia, are very thankful to him to give us the opportunity. It was indeed beneficial to the audience (150-200 people including doctors and patients) of which only 3-4 had heard about fibromyalgia. While I was too nervous and realised later that I spoke pretty fast, the meet gave me the confidence to speak in front of a huge audience and motivated me to give my 100% to my awareness initiative. I would like to request you all to go through this video of my presentation (please don't mind the quality, I have added the subtitles) and share it to help us generate awareness. Who knows someone somewhere could find it of great use! Do spread the word about Fibromyalgia by talking about it to people you know. You can Like and Share the Facebook page of the blog. Follow us on Twitter or join our Pinterest board. I really didn't know the details about Fibromyalgia till I saw your video. Guess there is always so much to learn from each other. Thank you Harleena! Oh ya, there are so many things about so many conditions that we aren't aware of. Like your article on breast cancer brought to light so much we didn't know. Thank you for trying to shed light on this debilitating condition, that I myself have been battling with for years, and trying to bring awareness to the unaware!!!! !